Pet hedgies do best if handled every day, even if it is for just a short amount of time. We recommend handling your hedgehog for at least half an hour a day. The easiest way to accomplish this task is 15 minutes in the morning and 15 minutes in the evening. Some hedgehog owners suggest that you wait for a few days to handle your new hedgehog, so that it has a chance to get accustomed to it’s cage. This is not a bad idea, but it is not always necessary in many cases. We believe that if your hedgehog is not showing signs of stress it is ok to handle it from the beginning. This allows the bonding process to start immediately with your new pet. Even with consistent handling they may take a long time to become accustomed to their new owners and environment. Like most pets, the more time you spend with your hedgehog the better socialized and friendly it will become. 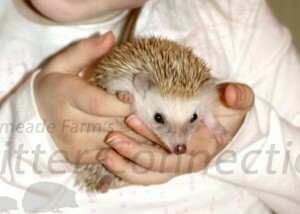 You will find that your hedgehog will be more receptive to handling or play at different times of the day. Some hedgehogs might be more active in the morning; others might be more active in the evening. Hedgehogs that want to run and play are likely to become frustrated if you try to restrain them in your hands. We typically handle our hedgehogs in the morning, because that is when it is most convenient for us and for our customers when they come to select their new pet. Keep in mind that the hedgehog’s nighttime is our day and vice versa. Giving your hedgie a chance to wake up is a key to daytime handling success. I know that when I have to wake up extra early to go to work or another early morning activity it takes me a little while to clear the sleepiness and get moving. Sometimes we expect hedgehogs to wake up and be active when really they need some time to get their bearings too! You might find that your hedgehog responds best to being held and cuddled after an hour or so of play or possibly after some time snuggling in a hoodie pocket or carry sack. Most hedgehogs are receptive to handling in the evening, because this is the time they naturally start to wake up and become active on their own. Keep in mind though, that evening is when hedgehogs may also want to eat. A hungry hedgehog may have food and not fun on its little mind. The first, and possibly the most overlooked, sign of stress is the hedgehog’s frantic attempt to get away. Many hedgehogs are busy and want to try to explore, but a stressed hedgehog will be much more persistent and not easily distracted. Green stool is the most obvious sign that your hedgehog is stressed. This result is from food going through the hedgehog too fast and you are seeing green bile.